"I have worked with Mike for 18 years to create three office locations, two ambulatory surgery centers and a recently completed significant building expansion. 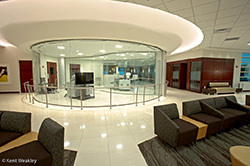 Given the task to design a unique, world class LASIK center, Mike delivered. He gave us the result we wanted to achieve – SPECTACULAR!" "The opening of our 55,000 square foot Orthopaedic Institute is a long standing vision realized. It has enabled our 20 physician musculoskeletal group to consolidate multiple clinic locations and ancillary services into a single facility that is not only patient friendly, functional and efficient, but an award winning landmark in the community as well." Issa F. Baroudi, M.D., F.A.C.S. "I greatly appreciate the help of Gordon & Associates, Architects in their successful design of my beautiful facility, which fully expresses where I stand on the issue of quality." -- Issa F. Baroudi, M.D., F.A.C.S. Internationally acclaimed Gordon & Associates, Architects, is a recognized leader in private healthcare design, providing fine quality medical service environments -- primarily ambulatory surgery centers -- throughout the U.S., South America, Europe, Asia and Australia. Committed exclusively to the private medical community since 1977, Gordon Architects delivers unmatched expertise in efficiency and productivity, principally in Ophthalmology, Orthopaedics, Urology and Plastic Surgery. Renowned for providing state-of-the-art architectural and interior design as well as space planning, engineering and healthcare consulting, the firm has designed and developed over 300 ambulatory surgery centers and over 240 medical clinics during its 30 years in practice. as a product of the design -- for patients, physicians and staff. and quality of life for all concerned. adds immeasurably to the value of every project." Web site hosted and maintained by hyperSystems, Inc.